At the heart of this project are stories of inherited objects collected from the Tonbridge School community. It has been a slow beginning in terms of creating a system whereby recordings can be made and sent to me. A handful of staff have come forward to record their stories in person, for which I am very grateful. These stories are very personal, full of history and emotion. Sometimes the most interesting narrative is what is left out, a pause, or a repeated phrase. A few boys have also sent me recordings (thank you so much!) but I would love to have many more so if you are reading this, please come and see me in the gallery or send me your recording via firefly as soon as possible. I have been working on a shadow tapestry whilst listening to and absorbing the stories I have collected. 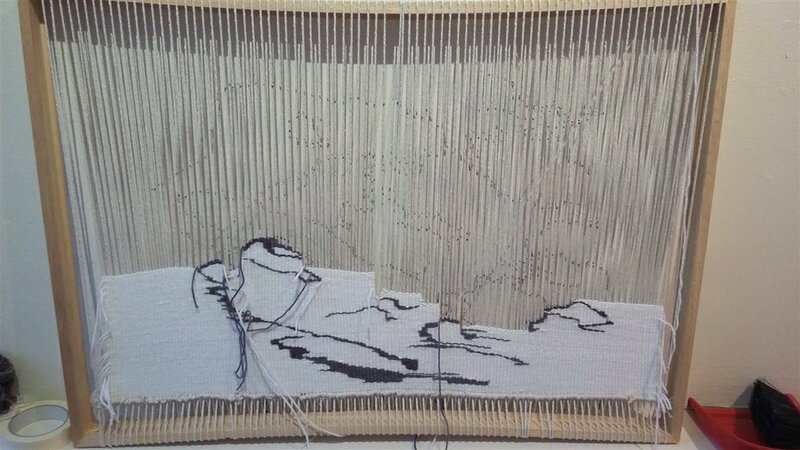 I am using Tapestry weaving as an embodied practice; a meditation on a transient memory induced by an inherited object. Through this process, the impermanence of a shadow becomes permanent in a medium synonymous with storytelling.